Margery Stratton was a grand-daughter of Sir John Lumsden. Margery was born and brought up in a small town in Pennsylvania in the United States, but spent a memorable year in Earlscliffe in 1935/6. Here is an extract from a correspondence with her. Because I was 12 when I arrived at Earlscliffe and everything about it, the people, the servants, the location was so different than my home in a small town in Pennsylvania everything stands out in my memory. The paths, and the lawn outside the "Morning Room" facing the Irish Sea are pretty much the same. A putting green was on the lawn and I have many photos of the house and grounds. My father and I arrived on July 21, 1935 and every evening sherry was served on the lawn and we all took our turn at putting while nibbling on cheese crackers and nuts (and I probably drank barley water with lemon squash with a squirt of soda as I was the 12 year old granddaughter). The view of Dublin Bay was so beautiful and when Dad's brother in law Douglas Latta arrived from Ayr to be with his wife Aunt Norah and their two children, Jennifer (4) and Stuart (2) shepherded by a Scottish Nanny, we would all watch from the boat from Scotland going to Dun Laoghaire where he would be met by Grandpa (Sir John) Lumsden or another member of the family as Betty Lumsden still lived at home (she was one of the twins and was about 26 years old). Actually Betty was studying piano at the Royal Academy of Music in London and home for the summer and at holidays. In that household were the cook Katie, and parlormaid, Winnie who later married the chauffeur, David, and Mr. and Mrs. Barnes who lived in an apartment between the main house and the barn/courtyard. Mr. Barnes was in charge of the garden and Mrs. Barnes made butter, took care of the chickens, and I have no idea who milked the cow which was out in the pasture. Ninnie was the woman who came to the Lumsdens when Grannie was expecting her first child (my father) born in 1897. She stayed with the family her entire life and was an excellent seamstress and made all the clothes that I wore to school etc. When we visited Betty's daughter Stella (L'Estrange) Durand, an Episcopal priest who lives in Wicklow in the town of Kiltegan and then Caroline (L'Estrange) Hamilton I learned a lot more -- but they are just a few years older than my eldest son, Bill, who turned 60 in July. The Christmas of 2005 Caroline sent us a book about the Guinness family and we learned so much more about Grandpa from that book. 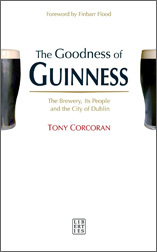 The book that Margery was referring to was "The Goodness Of Guinness" by Tony Corcoran, published in 2005 by Liberties Press. This book is an "illustrated social history of the St James's Gate Brewery, including in-depth discussion of the major contribution made by the Guinness company to the welfare of its staff and the wider community." . It contains many stories about Sir John Lumsden and his work at the brewery. The foghorn that Margery mentioned used to be a regular nightly sound, but alas is no longer heard. The fog signal at the Baily lighthouse was stopped on 11th January 1995 due to changes in technology aboard ships and boats which had made such a signal redundant. For those of us who remember the low rumbling sound of the foghorn at night, it certainly didn't keep you awake, but was more like the comforting purr from a resting but watchful wild animal as it gently protects the sailors from the dangers of the rocks. It is sadly missed.